For many, many years an injustice has been done to a great musician, that musician being Guitarist, Vocalist and Composer, Keith Kerwin, or as he should more correctly be called, Sir Keith Kerwin K.C.R.O. (Elevated to KCRO April 21 2010). The injustice being that until recently Sir Jon English has incorrectly, as it turned out, been given the accolades and recognition for composing the Principality's National Anthem when in fact it was Sir Keith, not Sir Jon who wrote both the music and the Lyrics to this wonderful and moving anthem. The Principality wishes to correct this long standing misunderstanding and apologise to Sir Keith for seemingly ignoring his great effort and attributing his work to another; something that should never occur and is a great insult and we are very thankful that Sir Keith understands how the error came to be and how it came to continue being wrongly stated. Sir Keith recently contacted HRH Prince Leonard "to catch up on things" and he also took the opportunity to ask that the record be corrected; the news was a great shock and I must say embarrassment to HRH and all of us in the Principality who had simply not realised that Sir Keith was in fact the composer. Deeper investigations also showed that we were not the only ones to be under the misunderstanding as we found that the Anthem has also been registered with APRA (Australasian Performing Right Association) with Sir Jon English recorded as the writer and composer. 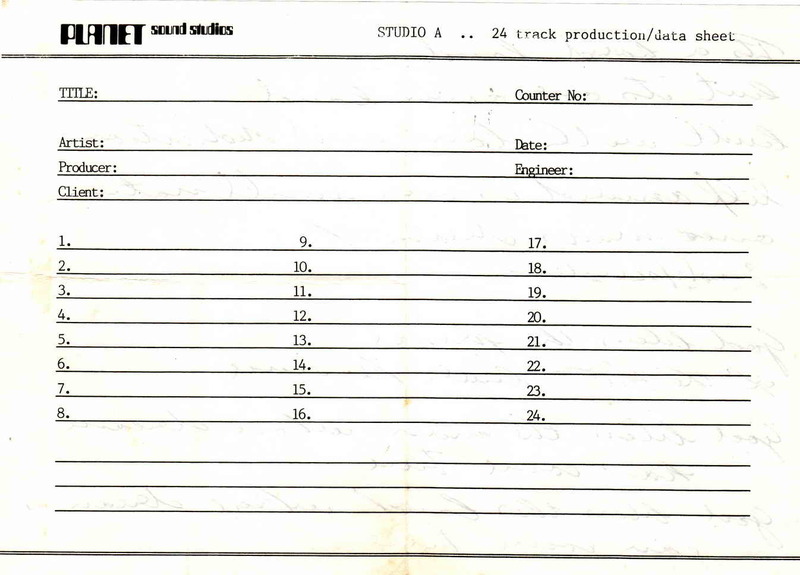 Fortunately all of the band, including Sir Jon English, quickly jumped in and assured us that Sir Keith was indeed the composer and the records at APRA have also been changed to show the Truth. We take this opportunity to again apologise to Sir Keith for the mistake and also to once again thank Sir Jon English and the members of the Foster Bros Band, Sir John Coker K.R.O. ...Bass and Backing Vocals, Sir John Dallimore K.R.O. ...Guitar and Backing Vocals, Sir Peter Deacon K.R.O. ...Piano and Strings [Synth], Sir Greg Henson K.R.O. ...Drums [Timpani], Sir Keith Kerwin K.C.R.O. ...Composer, Acoustic Guitar and Backing Vocals, for their great efforts in support of this Principality in supplying us with such a great Anthem and indeed supplying us with the original recording which is still the preferred version played today at every Official function of the Principality and particularly wherever Prince Leonard himself is concerned. In order to make sure that from now on all is remembered correctly, we asked Sir Keith to drop us a note of his recollections of how the Anthem came to be, rather than try and re-write what he supplied we have decided to simply publish his recollections in his own words. 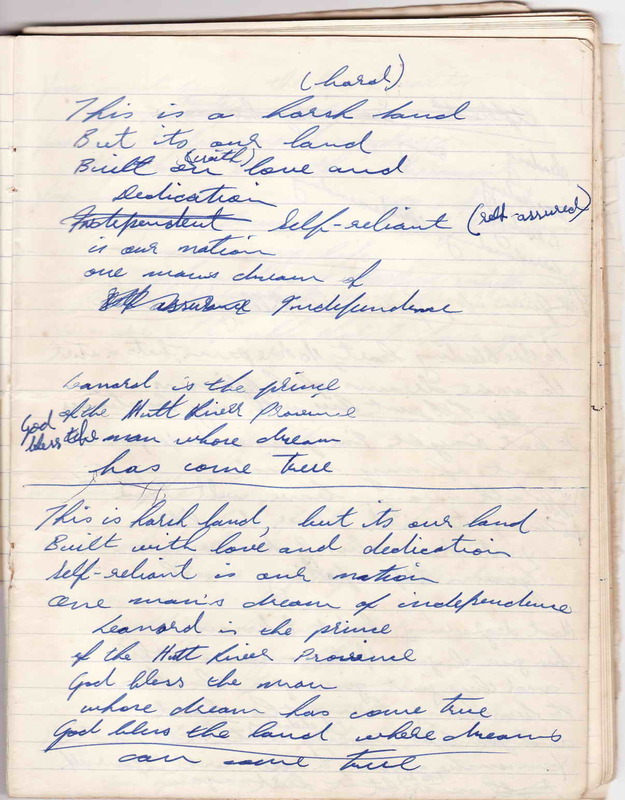 Sir Keith has also provided us with copies of some of his original motes as he composed the lyrics to the anthem and we are able to show these below. Maybe the guys will find time to record that "updated" version for the 40th Anniversary in 2010, we will have to wait and see! If we all ask nicely...............? Thankyou again to Sir Keith Kerwin K.R.O., the Late Sir Jon English (March 26 1949 - March 09 2016) and the Foster Brothers Band. The origins of The Hutt River Anthem. By Sir Keith Kerwin K.R.O. I can't remember the exact dates but I can approximate reasonably. It was 1984, GTV9 studios, Melbourne, Victoria, and I think it was a Thursday night. Prince Leonard of The Hutt River Province was making a guest appearance on The Bert Newton Tonight Show. He was there on a promotional visit and as part of that was knighting Bert on the show. Jon English and his band ‘The Foster Brothers’ were also making an appearance on the show. It must’ve been around the end of July into August thereabouts. Prince Leonard, ‘No, I’ve never really thought about it to be honest’. Jon, ‘Oh well then, why don’t we write you one, and you can make us knights huh’. PL ‘That sounds like a great idea’. So the thought was germinated then basically forgotten about, for a short while. I remember it was September because it was Grand Final weekend and Jon and The Fossies always had a BIG weekend at this time. We usually played a very late gig on the Friday night, 3am finish, then a very early gig Saturday morning at the [then] Fitzroy Lions champagne breakfast, 6am start. Consequently we didn’t sleep. Then after the breakfast, stagger off, half tanked, to the Final as guests of the club. On this occasion I elected not to go to the footy, I’m from Queensland and brought up on Rugby Union besides, I could watch it on telly and one of [Victorian] crew could have the ticket, and I could catch up on some sleep. So it was during this particular afternoon that the mention of the Hutt River Anthem popped back into my head. It was my usual practice and still is, to dig out the guitar and do finger exercises or just strum some chords that I happened upon the melody for what was to become The Hutt River Anthem. ‘Oh OK, that’s not bad’ I remember thinking, lets see about some words, so at this point I set about ‘the words’. Where are we again, half way up the coast of WA, pretty rugged up there isn’t it? What are they doin’ there, succeeding, setting up their own place etc, ok. So what’ve we got humm…’It’s a harsh land but it’s our own land’. Basically the rest just flowed like it was already written, it just had to be put on paper. 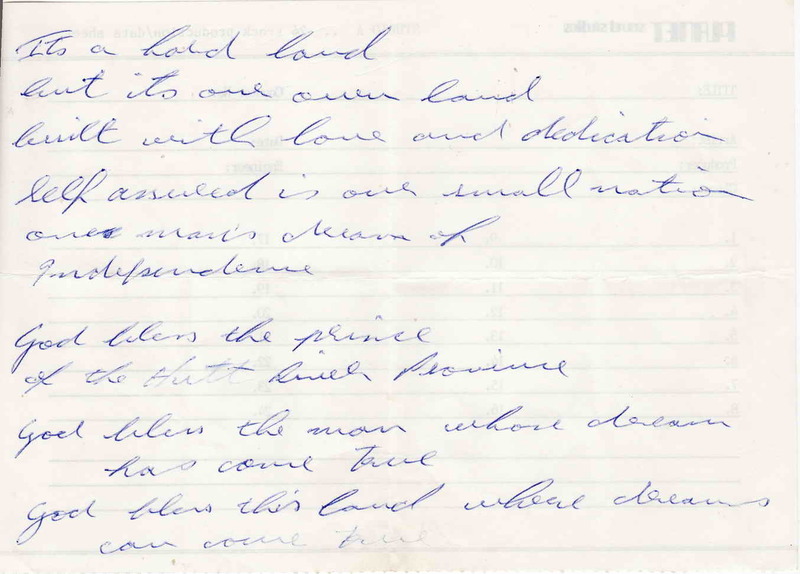 I remember my original line for the chorus was ‘Leonard is the Prince of the Hutt River Province’ which I later changed to ‘God Bless the Prince’, thinking it was a bit more anthem-ish. Later that same evening back at the gig I played it for Jon and the guys, ‘Hey guys I’ve got an idea for that anthem thingy’. They all approved enthusiastically, then it was promptly forgotten for another short while. Moving along, the timings a bit vague on this next bit, and I may out overall, the process may have begun with the Bert show in ‘83. I know we were knighted in ‘84. We were touring over in WA a couple of months later after writing the anthem when the subject popped up again and we found ourselves in a recording studio in Perth. We, Jon and the band members, put our heads together musically, and came up with the arrangement of instruments, piano intro, Timpani drum roll into the key change. Jon sang lead, the band sang back-up vocals. We resisted the urge to stick a blazing heavy metal guitar solo in it...humm maybe if we do an updated version for the 40th anniversary. So that’s the basics of how the Hutt River Anthem was born. God bless one and all. Words & Music by Sir Keith Kerwin K.R.O. Recorded by: Sir Jon English K.R.O. and the Foster Brothers. Lead Vocal …Sir Jon English K.R.O. during that Footy Grand Final! Download a copy of the Musical Score of the Principality Anthem!